Kojiro YAMASHITA - VP, Procurement, Japan Airlines and Paul Lochab, Chief Commercial Officer, Satair. The service will commence from June 2019 in line with the delivery of the first of 31 A350XWBs (18 A350-900s and 13 A350-1000s plus options for a further 25 aircraft) on order with the airline. First service planned for the new aircraft will be in September 2019 on the Tokyo Haneda-Fukuoka route. 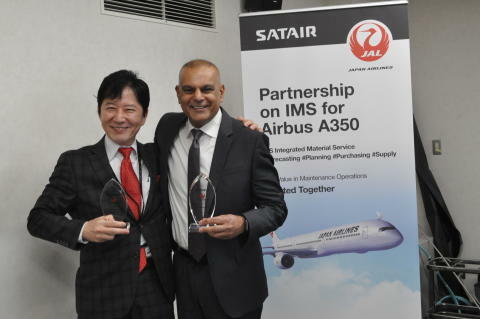 The service to be provided by Satair will be covering all airframe expendables for the aircraft and will be provided through an on-site stock to JAL. The service includes planning, sourcing, purchasing, logistics and inventory management. Mr. Atsushi Maeda, Executive Procurement Officer of Japan Airlines said at the contract signing ceremony: "The A350 aircraft will play an important role for JAL. We believe this agreement will provide us stable and safe operations at the highest level for our valued customers. Furthermore, it provides us an added advantage to optimize our maintenance costs, while enhancing the long-term partnership with Satair." IMS was introduced by Satair as a strategic initiative to respond to customers’ growing requirements for a fully-integrated expendable inventory. This enables customers to focus on their core activities of operating and/or maintaining the aircraft. IMS is a flexible and fully-customizable solution that is developed in close collaboration with the airline to create a true partnership. With IMS, Satair is directly involved in supporting the aircraft availability, which goes well beyond a traditional customer-supplier relationship. Japan Airlines (JAL) was founded in 1951 and became the first international airline in Japan. A member of the oneworld® alliance, the airline now reaches 349 airports in 52 countries and regions together with its codeshare partners with a modern fleet of 233 aircraft. JAL Mileage Bank (JMB), the airline's loyalty program, is one of the largest mileage programs in Asia. Awarded as one of the most punctual major international airlines and a certified 5-Star Airline by Skytrax, JAL is committed to providing customers with the highest levels of flight safety and quality in every aspect of its service, and aims to become one of the most preferred airlines in the world. Satair is a global company and world leader in the commercial aerospace aftermarket. The company supports the complete life cycle of the aircraft with a full and integrated portfolio of flexible, value adding material management products, services and tailored support modules across all platforms. As a key part of Airbus customer services, Satair has exclusive or primary distribution arrangements for aerospace component manufacturers, and supplies parts to multi-fleet customer airlines and MRO companies. 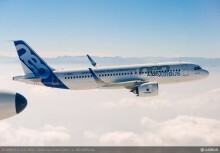 It also fulfils the material service support obligation for the in-service fleet of more than 7,000 Airbus aircraft. Visit www.satair.com. All Nippon Airways (ANA) of Japan has signed a multi-year IMS contract with Satair – an Airbus services company – for a long-term, fully integrated end-to-end supply chain package covering expendable material for the airline’s continuously growing 18-strong A320 family fleet, comprising A320CEO and NEO and A321CEO and NEO. Satair Group’s “Integrated Material Services” (IMS) has won their first A350XWB customer, Cathay Pacific Airways, and has started their new service offering for the airline’s fleet of 48 Airbus A350XWB aircraft. 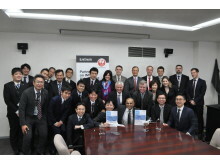 JAL, Satair and Airbus staff gather for a group photo after the signing ceremony.